Greetings Reid Temple Family I am excited about all that the Lord has done in the life of our church over the past few weeks including the many celebrations around my retirement as Senior Pastor. Sis. Anna and I are forever grateful and were humbled by the outpouring of love shown by our Reid Temple family. We have agreed to continue serving over the next few months until the new Senior Pastor has completed their transition. The 69th Session of the Washington Annual Conference was a great time of celebration for our church. At this 69th Session, several new Itinerant Elders and Deacons were promoted from amongst our ministerial staff. In addition, several others were promoted and advanced to the next year of study. Be in prayer for them as they continue to press on in their calling. We were equally excited by the formal entry of Kingdom Fellowship African Methodist Episcopal Church into the Washington Annual Conference and the appointment of Reverend Matthew L. Watley as Senior Pastor. This is the culmination of thirteen years of our evangelistic efforts and the prayers, giving and faith of all the dedicated believers who have served our North Campus. As we continue our personal journeys through this Season of Lent, we join believers everywhere in preparing for Good Friday and Easter. The events of Easter serve as the ultimate expression of grace and the defining moment of our faith, the resurrection of Jesus Christ, our Savior and Lord. We are being called to continue our evangelistic outreach for the Kingdom in Laurel and surrounding communities. We are, therefore, very excited to announce the first of our series of Sunday Pop-Up services scheduled on Easter Sunday by the New Life Laurel ministry in Laurel. We are also looking forward to celebrating Holy Week with our â&#x20AC;&#x153;Easter At The Templeâ&#x20AC;? production. The Reid Temple Music and Fine Arts ministry is preparing now to celebrate the resurrection along with several special guest artist. As we close out this season of Lent and begin the season leading to Pentecost my prayer is that you and your families draw closer to God. I pray that the Kingdom of God will continue to manifest in remarkable ways in your lives, through our church and for His glory. Discipleship Wednesday - Special Service | Wednesday | 7pm Membership To Discipleship (M2D) Recognition Service* Honoring all members who participated in the M2D Classes in the past *Note: This is for Membership To Discipleship Classes, only. Save the Date: "RESILIENCE: You Can't Keep a God-Woman Down" Women's Discipleship Master Class & Worship Service Saturday, June 8, 2019 9am-6pm | Details forthcoming! CAN’T MAKE IT TO CHURCH? WANT TO SERVE IN MINISTRY? 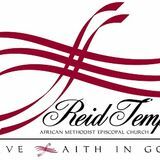 Get insight into what's going on at Reid Temple AME Church during the month of April.